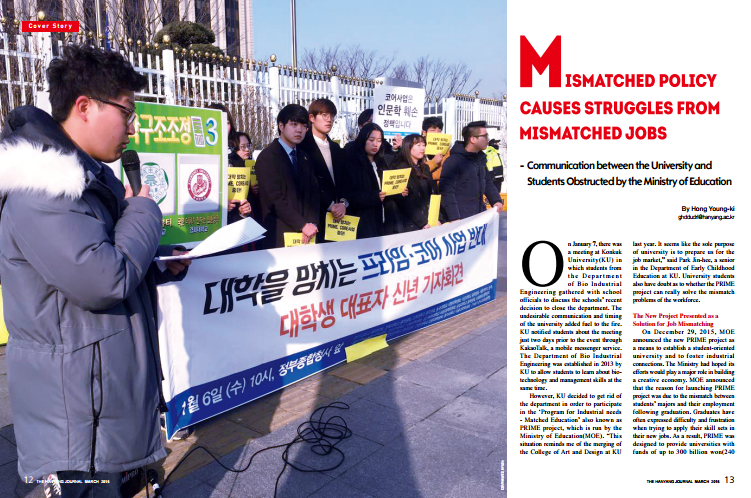 On January 7, there was a meeting at Konkuk University(KU) in which students from the Department of Bio Industrial Engineering gathered with school officials to discuss the schools’ recent decision to close the department. The undesirable communication and timing of the university added fuel to the fire. KU notified students about the meeting just two days prior to the event through KakaoTalk, a mobile messenger service. The Department of Bio Industrial Engineering was established in 2013 by KU to allow students to learn about biotechnology and management skills at the same time. However, KU decided to get rid of the department in order to participate in the ‘Program for Industrial needs - Matched Education’ also known as PRIME project, which is run by the Ministry of Education(MOE). “This situation reminds me of the merging of the College of Art and Design at KU last year.It seems like the sole purpose of university is to prepare us for the job market,” said Park Jin-hee, a senior in the Department of Early Childhood Education at KU. University students also have doubt as to whether the PRIME project can really solve the mismatch problems of the workforce. On December 29, 2015, MOE announced the new PRIME project as a means to establish a student-oriented university and to foster industrial connections. The Ministry had hoped its efforts would play a major role in building a creative economy. MOE announced that the reason for launching PRIME project was due to the mismatch between students’ majors and their employment following graduation. Graduates have often expressed difficulty and frustration when trying to apply their skill sets in their new jobs. As a result, PRIME was designed to provide universities with funds of up to 300 billion won(240 million USD), to bridge this gap. Starting from 2016, PRIME will grant a total of 2,012 billion won(1.63 billion USD) in funds over a period of three years. The project is divided into two sections based on the size of adjustment of students into big sector and small sector. Universities that want to take part in the large sector are required to either adjust the number of enrolled students by a minimum of 10 percent or the entrance quota by more than 200 people. However, adjustments made within the same department are only acknowledged for 50 percent. Repetitive eight other universities will be additionally selected and will receive funds of 150 billion won(120 million USD). In the small sector, universities are required to relocate five percent of enrolled students or the entrance quota by 100 people. With a total of 500 billion won(400 million USD) in funds, MOE will select 10 universities among the list of applicants and grant them each 50 billion won(40 million USD) over three years. With the flexibility and autonomy provided to universities involved with PRIME project, MOE hopes that these schools will become more studentoriented in terms of their curricula and structure. In addition, the program will provide students with the support needed to choose curricula that best fits their talents and aptitudes. Finally, this program is expected to resolve the problem of job mismatch and the declining quality of university education. Moreover, MOE plans to reduce the number of graduates in the Humanities Department and intends on increasing the number of those in the engineering and medical fields. Unfortunately, PRIME was launched without communication between the university and students. “Even the General Student Association(GSA) was unaware of the PRIME project at HYU. The GSA only had information that was already disclosed to the media,” said Jeon Yong-gi, the student president of the HYU ERICA Campus. Regarding the media, according to the University News Network(UNN), a well-known university online news portal, the HYU ERICA Campus already has a strategy planned out to take part in the large sector of the PRIME project. HYU has decided to merge the Department of Journalism and Mass Communication, the Department of Computer Science &Engineering, and the Department of Industrial Management Engineering into ‘Media Tech’. The university has also merged the College of Design, the Department of Material Science &Chemical Engineering, and the Department of Computer Science &Engineering into ‘Design Tech’. HYU is now discussing adjusting the number of enrolled students by at least 200 people. For their part, Hanyangians are raising questions about the information that has been released by the media regarding the merging of HYU departments. “I cannot but feel irritated that HYU h a s n o t released any information about the P R I M E project. I have been studying at the Design University for three years and I believe that design and engineering are two completely different fields. Compared with engineering, design places importance on visuals and the sensibility of an individual. It would be hard to study both majors at the same time. If they were to be combined, it would be difficult for students to find what they have an aptitude for. Merging design and engineering together will only lead to students gaining superficial knowledge about both majors,” said Shin Do-eun, a senior in the Department of Entertainment Design at HYU. Many Hanyangians believe that HYU did not make any effort to communicate with Hanyangians. Looking at HYU’s attitude towards the PRIME project, a lot of Hanyangians feel that the university does not bother to try and reflect students’ opinions when making plans. “HYU did not make an announcement or even try to communicate to Hanyangians regarding the plans for the PRIME project. HYU also failed to take Hanyangians’ opinions into consideration when merging the university’s departments. I would like to be informed about the plans of HYU in advance,” said Lee Eun-ji, a senior in the Division of Business Administration at HYU. As HYU did not ask Hanyangians about their views, once the PRIME project begins, departments will be evaluated based on students’ employment rates rather than the quality of the education provided. As a result, opponents believe the university will be turned into an academy whose sole purpose is to prepare students for the job market. Furthermore, evaluation based on employment rates will result in the disappearance of fundamental studies, critics claim. Last year, MOE granted funds to universities to develop diverse new majors based on the characteristics of their school. But starting this year, MOE is doing the exact opposite and supporting uniformity. Since 1995, regulatory red tape regarding university establishment has been cut. Although students have been more educated than before, the type of jobs available in the job market has remained the same. This mismatch has led to an increase in the economically inactive population while increasing socio-economic costs. “Because of the mismatch of demand and supply in the job market, there are fewer engineering graduates than are needed in the field. Human resources are being distributed inefficiently. In Korea, human resources are utmost importance because when university graduates enter the workforce, they help revitalize the economy. However, because of the inefficient distribution of human resources, graduates are resorting to more stable jobs for example as public officials. This phenomenon is worsening the situation even more,” said Ha Joonkyung, a Professor in the Division of Economics at HYU ERICA Campus. The biggest problem of MOE’s policies is that they are shaping universities to meet the needs of companies. “As universities are for general studies, changing it to meet company needs will be a wasted effort. Teaching students based on what companies want is not only impractical but also unnecessary,” added Professor Ha. Last year, the youth unemployment rate was at its highest at 9.2 percent. Other countries are struggling with youth unemployment as well. In 2013, Spain had a youth unemployment rate of 42.4 percent and France had a rate of 18.4 percent. But in comparison, Germany had a low youth unemployment rate of only 7.3 percent. Germany has job training system that everyone can participate in. Also, when in an economic recession, the government controls the working hours of the older generation and substitutes younger people for the remainder of the time. Corporations that carry out this policy are granted funds by the government. “Unlike Korea, universities in the United States focus on general studies that are important to students. Also, universities do not reorganize their structure to enhance employment rates. By promoting general studies, the United States was able to become the driving force in today’s global market,” said Professor Ha. For universities, because of the PRIME project, the only way for the humanities department to survive is by changing it into the College of Liberal Arts. 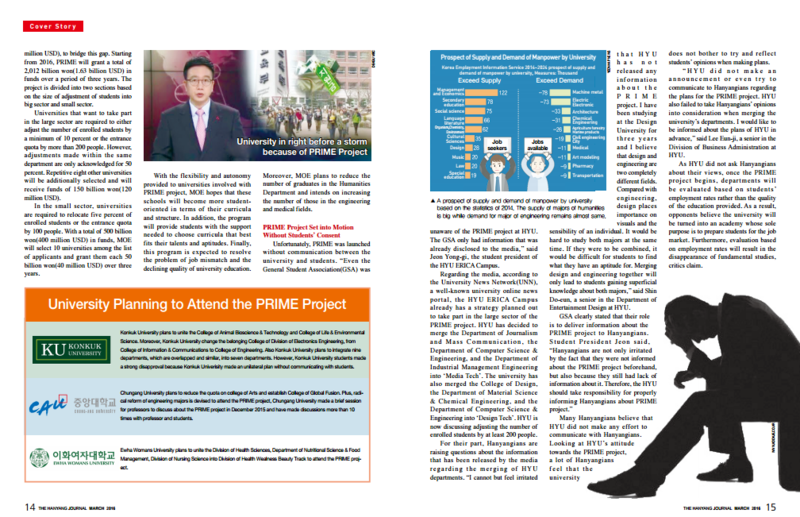 MOE launched the PRIME project because they thought the mismatch was caused by a discrepancy between demand in the job market and the number of university graduates. “Because of the low employment rate in the humanities department and the higher rate in the engineering departments, restructuring the entrance quota was needed to a certain extent. However making adjustments to the entrance quota based on just the employment rate is highly unadvised. The situation is likely to change in the future and a quick solution might prove to be fatal later on,” Professor Ha advised. Prior to the PRIME project, there were many other policies managed by the MOE to resolve youth unemployment. Looking back however, they seem to lack of fundamental measures that could really solve the issue. All policies made by the older generation focused on fixing the unemployment problem in the short run. A genuine solution devised from a larger view is needed to resolve youth unemployment. “We are planning on discussing the PRIME project with HYU and its students in March. Because HYU is repeatedly stating that they do not have a specific plan for PRIME, we need to make sure that they are on the right track. Applications for the PRIME project are due by end of March, so HYU should have a specific strategy by then. During the students’ general meeting, GSA will ask HYU to make a statement regarding its plans for PRIME and firmly request that they listen to the opinions of Hanyangians,”said Student President Jeon. The university and MOE are not the only ones who should be communicating with students; companies and the government should do so as well. “To reduce the mismatch between young applicants and jobs, fundamentally good jobs need to be created. In order to this to be feasible, small and medium sized businesses need to prosper as major companies have a limited number of jobs. Therefore, not only support is needed for small and medium sized companies, but also appropriate policies to ensure that university graduates have no trouble starting a business.” concluded Professor Ha.